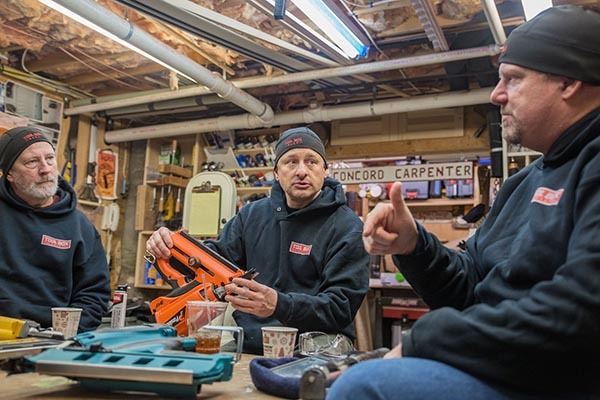 The Tool Box Buzz crew assembled in Concord, MA to assess four gas powered nailers and one cordless framing nailer. Ambient temperatures during testing were roughly 20F and equipment was left out overnight to simulate standard field conditions. Framing equipment is often stored overnight in unconditioned spaces, or outdoors in weatherproof jobsite boxes. Temperatures were recorded as low as 9F overnight and all components of the tool; nailer, battery, and fuel (if applicable) were kept outdoors. 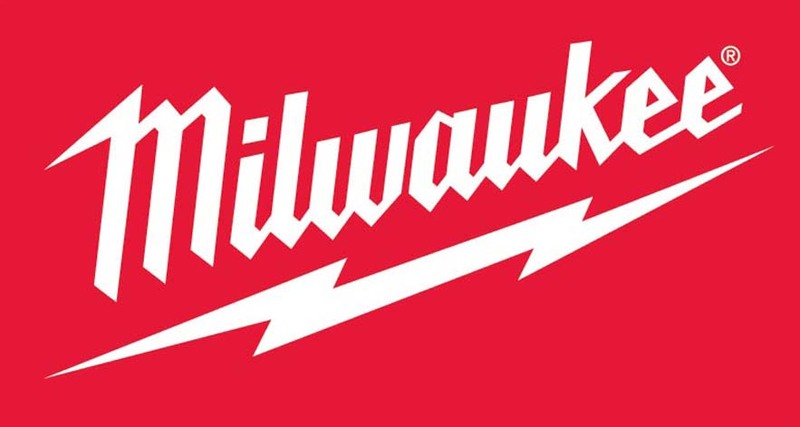 Testing began at approximately 8:00AM, the heavy, medium, and light duty applications were accomplished with the nailers cold from the overnight storage. A lunch break was taken and nailers were aggressively heated and the strapping/overhead application was tested. 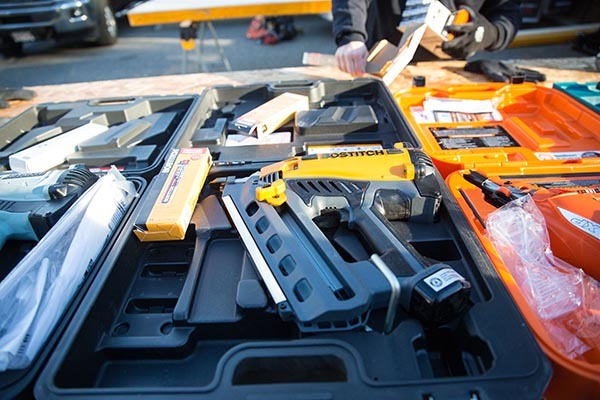 The field of tools assessed included two nailers not readily available in the US market. The Bostich GF28WW has been discontinued, possibly globally, and the Makita GN900S is only available in Canada at this time. The major home improvement box stores in the U.S. market have discontinued the Hitachi NR90GC2. Although, the Hitachi NR90GC2 appears to be available for purchase online. Leaving only the DEWALT DCN692B 20V MAX XR Brushless 2 Speed Nailer and the PASLODE 905600 Cordless XP Framing Nailer readily available to the U.S. contractor and consumer. 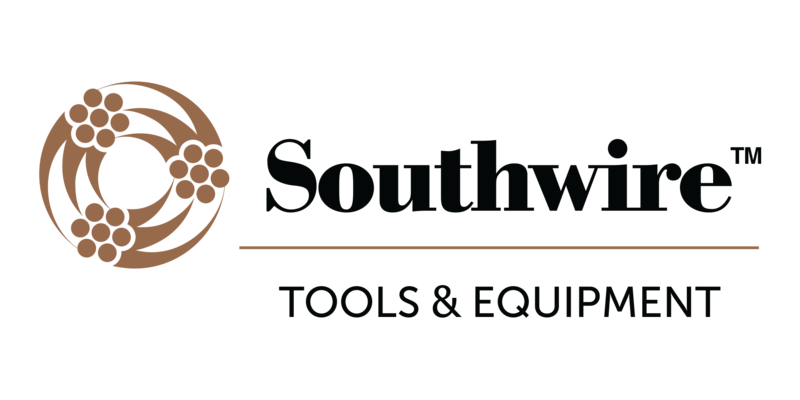 All tools can be expected to be purchased on the secondary market directly between consumers. Amazon.com typically reflects the most affordable pricing in the marketplace and is used as a baseline when available. The Makita nailer pricing was pulled from Home Depot Canada and adjusted for the US/CA exchange rate at the time this section was written. The DEWALT pricing below is for the nailer and one 4.0 Ah battery pack and charger. The DEWALT represents an anomaly in the test as well. It requires no gas and therefore as long as you have charged batteries, you’ll never run out of the fuel. Furthermore the gas cartridges do not need to be purchased repeatedly over the life of the tool, which presents the gas-less model as possibly the lowest cost of ownership to the end user. However, it should be noted, the DEWALT relies solely on battery power, which means the battery pack will be cycled through significant charging cycles. Users should evaluate the cost of replacing the larger battery when evaluating total cost over the life of the tool. The performance our crew experienced during our testing reflected very positively on PASLODE, it consistently performed well in all tests and the cold temperatures had the least effect on reliability. When comparing pricing with performance the Hitachi is well positioned to be the highest value tool of nailers tested, with performance ranking just below the PASLODE but at a price point $100 cheaper. The Makita is the most expensive, and also not available in the US. Battery pack only tools becoming more prevalent in to the market pose a major threat to the gas powered nail nailer. Cordless Platforms provide users with the option to swap batteries between tools, and purchase Bare tools to expand their tool compliment affordably. The gas powered nailers have a distinct power advantage, but as we have seen over the past 5-7 years, cordless tools are becoming more powerful each year and it is inevitable that the platform will match gas performance, assuming manufacturer’s focus on the framing nailer category. 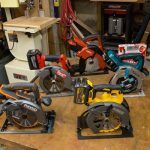 Examples to explain this are high demand cordless tools like Mag Drills, Rotary Hammers, Miter Saws and Table Saws that have all recently made significant gains with their cordless platforms. As referenced above all tools were accompanied by a protective case to store nailer, charger, batteries, and a few accessories. The DEWALT can be purchased in a kit with a 4.0Ah battery and a case sold at retail for $399. The battery voltage and technology varied slightly within the gas models. The Hitachi and Bostich models shared a legacy 7.2V 1.4Ah Ni-Cad battery. The nailers, let alone the batteries appeared almost identical, but performance varied enough that we do not anticipate the battery life to be the same between these two models. The Makita and PASLODE both featured more modern Lithium Ion battery, the PASLODE with slightly more voltage, but advertised a significantly higher battery life in terms of nails driven. Makita advertised only 4,000 while PASLODE more than doubles this claim with 9,000 nails. The PASLODE also features the unique on/off slide to conveniently disengage the battery and prevent ghost drain of the tool. Again the anomaly in the category is the DEWALT. Which can accept any slide pack battery in the DEWALT 20V and/or FlexVolt family. This drastically impacts the range of performance and life of each battery per charge. Based on our testing with a 60V 2.0Ah FlexVolt battery, which was at temperatures below optimal performance ranges for the tool, we did not observe notable improvements in power. We assume the nails per charge would be increased, but this was not tested. Ultimately the larger battery pack did not improve the tools ability to drive nails in the cold weather, at 20F, based on our observations. Another considerable issue with the DEWALT is the weight of the battery which affects the total weight of the tool. Clearly the added weight can cause user fatigue and reduced performance when working in overhead applications. Testing did not include an endurance component. Advertised ranges were considered during field-testing. Limiting factor on Cordless Gas Nailer is the fuel cells, maxing out at 1,200 nails. 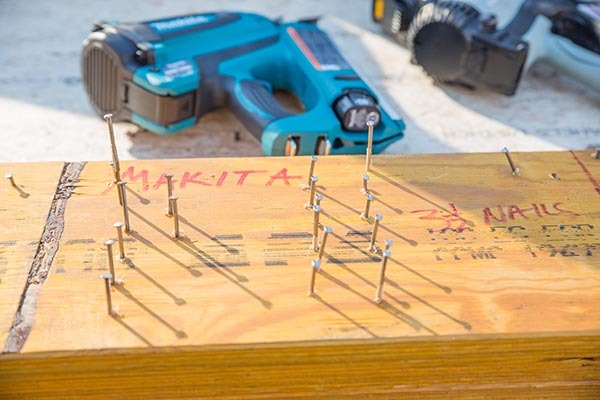 As stated above under “Battery” section PASLODE advertises 9,000 nails on one charge, Makita 4,000, Hitachi 4,000, Bostich did not advertise a nails per charge, considering the tool design and performance we assume it would match the models in the 4,000 range or fall slightly below. The DEWALT with no fuel falls well below the gas powered tools, at 700 with a 4.0 Ah battery. Perhaps with the FlexVolt battery the numbers could get into the thousands, but most likely still be well below the gas powered options. 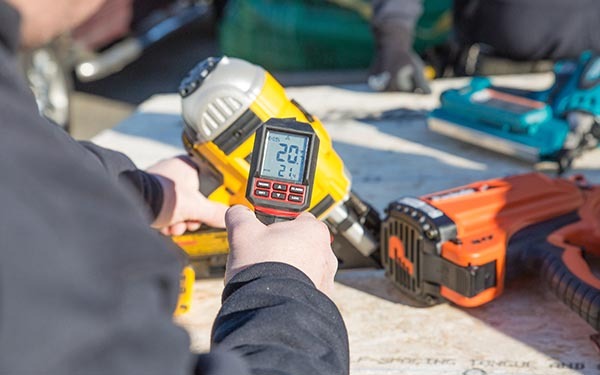 In previous assessments of the DEWALT DCN692B we did some endurance testing by continuously firing the nailer until failure or battery drain. Equipped with a XR 4.0AH lithium ion battery pack we used 12d nails. DEWALT claims the nailer will fire up to 700 nails. We stopped only to reload the nailer and fired 504 nails before the battery drained and on a second test we got close to 600. 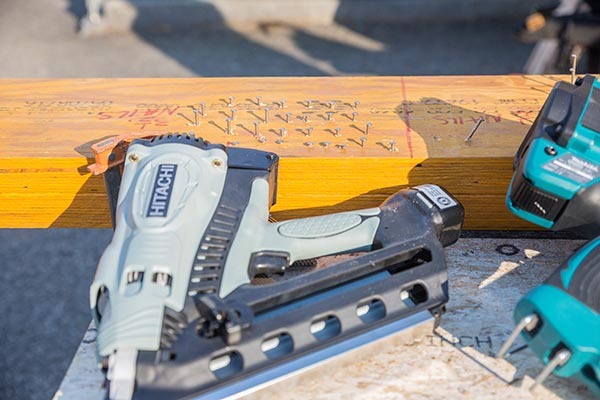 DEWALT claims that the more you use this nailer to closer you’ll get to the 700 nails per charge depending on length of nails, density of material, bump or sequential mode operations. They claim that the nailer has a break in period, similar to a car. The jury is still out on that and we’re still using it in the field testing! Ambient temperatures during testing were roughly 20F and equipment was left out overnight, with a recorded low of 9F, to simulate standard field conditions. Hitachi advertises to users the tool may “fail to operate” below 32F. 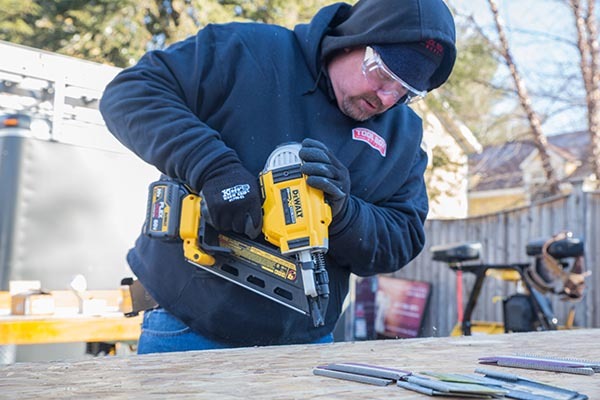 DEWALT recommends actuating the tool 10-15 times on scrap wood when operating in below freezing temperatures and cautions against charging battery packs below 40F. No references were available for the Bostich Nailer and Makita did not make any reference to cold weather performance or limitations in the users manual. PASLODE and Hitachi models performed consistently at the 20F ambient temperature. The Makita, BOSTICH, and DEWALT were slow to start and required troubleshooting or “warm up” shots to get the nailer to fire the nail consistently and/or at the appropriate depth. The DEWALT was most troublesome of the group, followed by the Makita. The BOSTICH did not perform every time like the PASLODE, but was not nearly as unreliable as the DEWALT and Makita, which almost never fired immediately. All nailers shared the same nail loading style, but only the Hitachi, BOSTICH, and Makita allowed users to slide the magazine feeder knob past already inserted nails. Both PASLODE and DEWALT models require users to slide the feeder to the bottom of the rail to a fixed position to accept additional nails. The ability to slide the feeder knob past nails reduces the steps required to reload the tool, which is repeated frequently during regular use. Nail capacity appears to be a limitation of the available clips of nails, rather than the nailer’s rail itself. The Bostich using clips of 25 nails creates a sweet spot where the rail can accept two full clips and therefore carries more nails than the rest of the field. All gas powered nailers are limited to a single fire mode, sequential firing, requiring the operator to release the trigger and re-engage the tool to fire a nail. Again the anomaly in this test was the DEWALT, which featured a bump fire mode. We did report the nailer was slow to start, but once it was warmed up and used on bump fire, it was a different nailer. While the DEWALT clearly shoots faster in bump mode than sequential, the overall speed isn’t much greater than some of the gas nailers. However, the perceived speed by the user seems to be better as the user doesn’t have to time squeezing the trigger with tip placement. The Paslode can keep up with the DEWALT if the user can focus not only on tip placement, but also timing the trigger actuation with the tip depressing the safety. For applications that have a consistent and repeating nailing pattern, like strapping or sheathing, bump fire eliminates that little extra step that when compounded adds up to a lot of saved time and less effort on the part of the user. The superior tip in the test was the DEWALT. Rounded and aggressive, it easily gripped to all materials tested and regardless of nailer orientation was able to remain steady. As nailer orientation is manipulated to access tight spaces, angle the nail to prevent completely penetrating through material, or toe nailing an effective tip ensures the nailer does not slip and prevents nails being installed incorrectly. The PASLODE, Hitachi, BOSTICH, and Makita shared very similar shaped tips, essential rectangular, with a few minor discriminators. The Hitachi and BOSTICH were identical and slid on harder materials, like the AdvanTec and LVL, they also did not provide tangs 360-degrees around the firing head. The Makita despite having a very similar head had more exaggerated flare to each point which made it grip better. The PASLODE provided 360-degree coverage around the firing head and had more complex tangs to grip material without limiting access to tighter spaces. During operation we recorded decibels at ear level during operation of the nailer at roughly waist height during the header construction of the testing. Decibels were recorded as an average. The range was not dramatic among the gas powered tools, but some distinct sounds were identified. The PASLODE had a more harsh snap compared to the Hitachi and BOSTICH, almost like a crack versus a snap. The Makita had a loud echoing report which was also distinct. Finally, just as distinct and noticeably quieter is the DEWALT with a mechanical whir and a significantly lower firing sound. Depth adjustment for the Hitachi, BOSTICH, and Makita are an antiquated onboard allen wrench adjustment. The DEWALT features a common nail nailer toolless adjustment DIAL, while the PASLODE sports a unique toolless SLIDE adjustment. The DIAL is a tried and true design, which we assume is more rugged and sensitive to minor tweaks than the slide model, although the benefit of the slide is speed of adjustment especially at extremes. 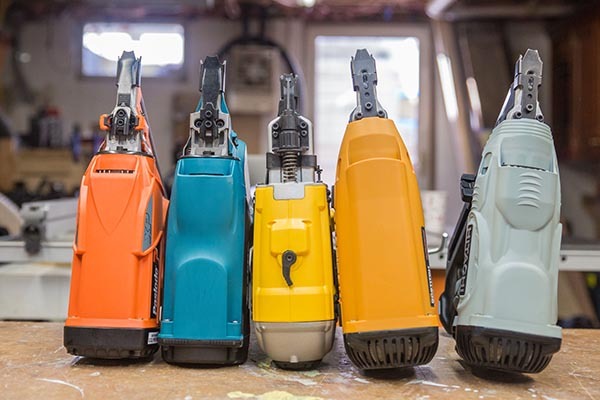 The ergonomics of the nailers were interesting to test given the similarity of the designs, with the exception of the DEWALT. The Hitachi and the BOSTICH almost have the exact shape, feel, and similar weight. The nailers are essentially the same from an ergonomic standpoint. 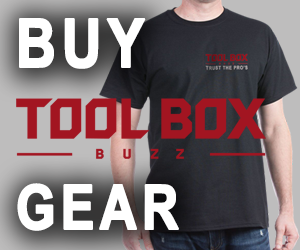 The same case can be made for the PASLODE and Makita nailers. While again, the DEWALT stands out as an anomaly, with a much smaller, but heavier design. The weight and balance of the tools were comparable across the board, same for the DEWALT. The difference in weight between the gas tools differ by a range of only about 1 pound. The balance and feel of the tools across the board were neither notable or offensive. While the DEWALT was the heaviest of the nailers, and the most compact, it felt dense in the hand. Conversely, the PASLODE was light and the most compact of the gas nailers. These observations were clear during the overhead application. 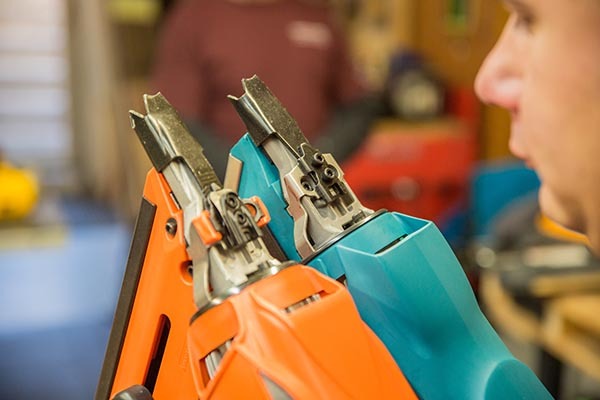 The accessibility of the nailers impact the user’s ergonomic experience, toe nailing and/or making connections in tight spaces can strain the user. The light, compact design of the PASLODE makes it the best in this category, but not by a significant margin. For this application we used 3-1/2” framing nails to fasten LVL headers together. We placed two 1-3/4″ thick LVLs together, and face nailed. No nailers were able to achieve full penetration consistently or at all. The PASLODE and Hitachi had the best performance, although the PASLODE was actually firing 3-1/4” nails so the performance was difficult to compare. But considering the ¼” difference, the Hitachi appears to have demonstrated the best performance in this test. From this testing, both the Hitachi and Paslode offer great nail driving power than the competition. Because none of these tools could fully seat the nails, we consider them to all fail this task from the perspective of having the “right” tool for the job. One of Hitachi’s core competencies is pneumatic nailers, it is clear the modifications or tweaks executed by Hitachi’s engineering team had an impact on the performance of the tool. This is especially evident when you compare the similarity of the BOSTICH to the Hitachi tools. The inconsistency between the 3-1/4” nails loaded in the PASLODE and the 3-1/2” nails loaded in the HITACHI made direct comparisons difficult. And the wild swing in depths of drive made data analysis difficult. In the spirit of ranking performance, we’ve included an “average depth of drive”, although all nailers failed this task to the point that users would not consider this tool for the application. Note – this test was performed outdoors in 20-degree Fahrenheit temperatures. For this application, header production (using engineered lumber), no tool tested met the appropriate needs of this task. Ultimately a user will have to take out their hammer to finish this task or hook up a compressor to get the job done in a productive fashion. No tool completed the task so these nailers, gas or cordless, are not viable options for this application. It should also be noted; the current International Building Code requires 3-1/2” nails in many structural framing connections. A recent ICC-ES Report (ESR-1539) does allow for alternate nail patterns that do allow for 3-¼” nails to be used, requiring additional nails at smaller spacing. While this does allow users to use the Paslode to be code compliant, it does add a layer of management that we feel is cumbersome. Users must be familiar with the alternative nail spacing, they must educate crew members, and they most likely will have to educate local building inspectors. So it’s very important for users of the Paslode to be current with the ICC-ES report. 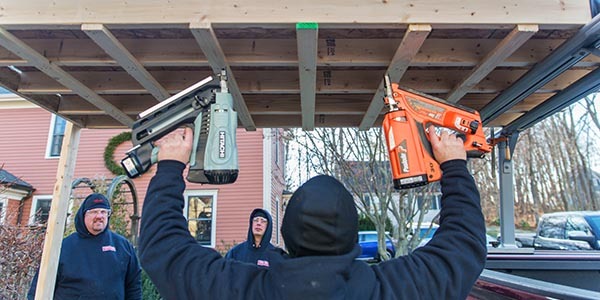 Framing crews don’t rely solely on a “cordless” platform for framing. This likely means they will have lots of 3-1/2″ nails on the jobsite for pneumatic nailers. They will also have 3-1/4″ nails for their Paslode. This takes an extra layer of management to keep everyone straight on nailing patterns when they use the Paslode vs pneumatic. 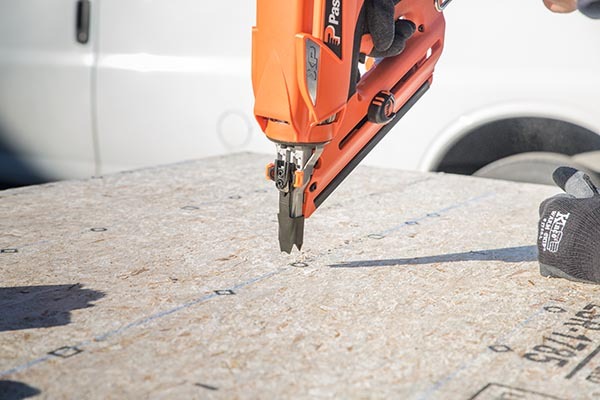 If the cordless/gas powered nailer is to be considered comparable with pneumatic tools, manufacturers of cordless/gas tools should strive to meet this heavy duty application. Also, Paslode should consider re-designing their nailer to accommodate full 3-1/2” long framing nails that are required by the IBC specifications. This will make it easier for construction crews to eliminate confusion and lost time explaining the alternate nailing of the ICC report. 3″ long framing nails. For this application we used 3” long framing nails to fasten 3/4″ plywood sub-floor to engineered studs (LVL). We assessed the performance of the nailer but considering the results, what was more important was the speed of application. We did find that all the nailers were able to perform this task and achieve full penetration with very few if any nails that were not fully seated. Each nailer, when operating appropriately, was able to successfully drive nails to the appropriate depth. So speed is the key discriminator in this application. During platform framing a user may adjust depth to go from framing walls to sheathing walls in a short period of time. Depth adjustment hurts the older model tools that require an Allen wrench depth adjustment versus a tool-less adjustment on the DEWALT or PASLODE. This application is more monotonous, subfloor installation requires few adjustments, most likely just the first few shots to set appropriate depth. In our evaluations of cordless (battery or gas) nailers we have found that the most important performance for users is speed of installation. Between our crews, and feedback we receive from other tradesmen, everyone wants to know if these tools can keep up with a pneumatic nailer. The flow of nailing with a pneumatic nailer allows users to repeat nailing patterns effortlessly. So we feel the bump fire mode is the only mode that keeps up with the speed developed by seasoned framers, while the extra step of sequential mode, compounds to disrupt that flow. With that all said, the DEWALT, with a bump fire mode would stand out as a better option considering the field relegated to sequential fire. 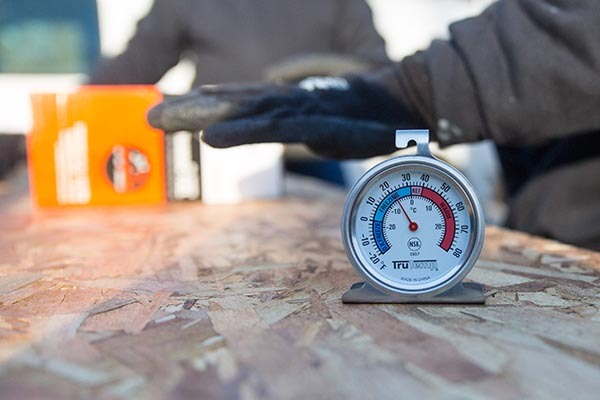 The constraint on the DEWALT during our testing was the cold weather performance. For a light duty framing application we used 2-1/2” nails to fasten 5/8″ plywood roof sheathing to traditional KD framing lumber. This application was similar to the one above when speed was considered. All tools were able to perform this task without any significant performance issues. 3/4″ Strapping is fastened with 2-1/2” ring shank nails. Our intent was to assess performance and ergonomics in overhead application. Again, no performance issues with fastening were noted, but we did experience an anomaly with BOSTICH where when held overhead fuel would not flow to the chamber to fire the nailer. The tool had to be dropped down to its normal orientation to achieve a normal shot. This action had to be repeated for each nail. The nailing pattern of two ring shank nails per joist/strapping connection makes for quick work with the advantages of a bump fire mode. However, one issue that does stand out for this task is the added weight of the DEWALT battery pack. The extra 2 +/- lbs can be a significant factor for user fatigue when using the tool for extended periods of time like nailing ceiling strapping. The DEWALT is even heavier than some of the new pneumatic framers on the market now. The advantages of a gas powered or cordless nailer are clear regarding convenience, mobility, and safety. The lack of a compressor speeds up setup and tear down, not to mention one less heavy tool to lug around. The subtraction of the pneumatic hose also improves safety and accessibility for users. The disadvantages commonly expressed among tradesmen are lack of bump fire, need to purchase and re-purchase fuel, and maintenance. Cold weather performance seems to be addressed by the fuel upgrades made by PASLODE. 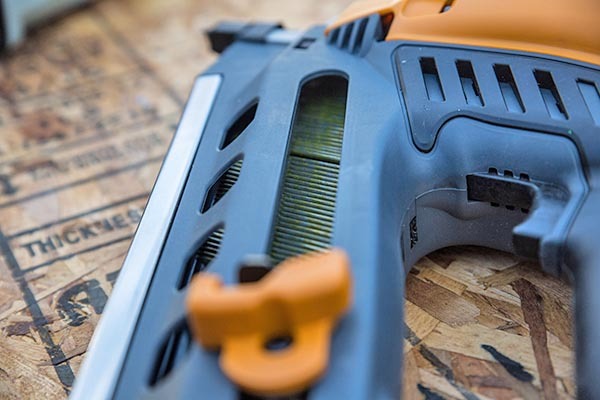 Users of pneumatic nailers want a bump fire option, it is key to productivity, the lack of this feature on gas nailers is the biggest downside of using this technology, DEWALT clearly shined on this feature. Other areas of improvement can be made on the tip, the DEWALT and Makita appeared to perform the best on a wide range of base materials. While the Paslode, Hitachi and Bostitch were similar in design, they could be improved to match the other two top performers. Maintenance should also be addressed if possible or at a minimum users need to be educated and maintenance needs to be as simple as adding oil daily to a pneumatic tool. While the Paslode’s maximum fastener size of 3-¼” meets the ICC approved alternative nailing requirements, it can be very confusing for users. 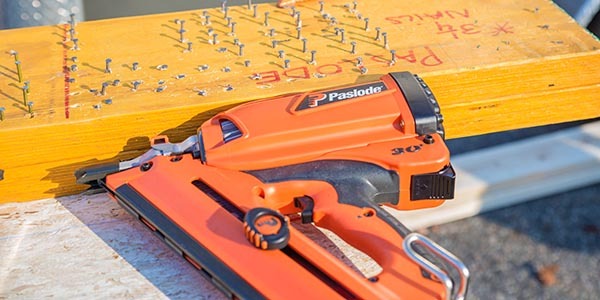 We feel that Paslode could benefit greatly by re-designing the nailer to accommodate 3-½” nails and boosting power to accommodate structural headers that utilize engineered lumber. It’s clear that cordless nailers must find a way to perform that task to truly compete with pneumatic nailers. 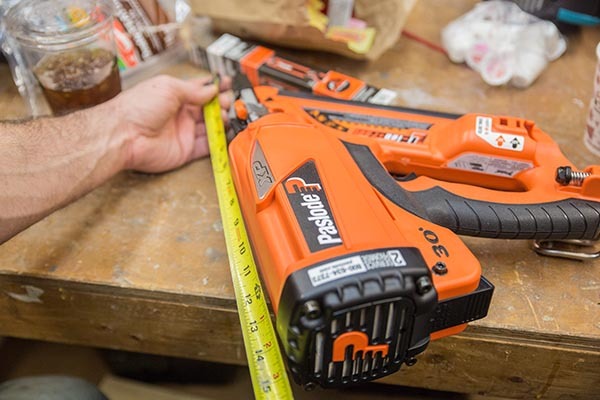 When it comes to gas powered nailers, the Paslode surely ranks at the top of the list when performance, ergonomics, and reliability are concerned. 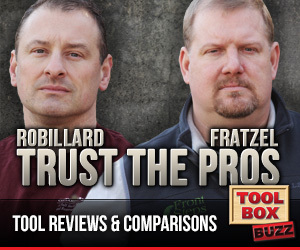 Paslode is still the top dog when it comes to “cordless/hose-less” framing nailers! With some slight advancements in it’s design it surely could compete with pneumatics and help “cut the hose”. I read a lot of horror stories about the makita online. It seems to be very similar to the paslode in design, some even suggesting that it shares the cylinder design of the paslode. During your testing, did the makita have any major blunders? Like constant misfires or jamming? Was it’s reliability lacking compared to the other nailer’s? I’ve just ordered my own makita nailer and I am hoping its not as bad as it sounds. I guess I could always return it if it’s crap, but Id like to avoid it if I can. In canada the makita is cheaper than the paslode, but is it worth the money? It performed well in our testing. I recently purchased the Dewalt framing nailer after watching lots of reviews on YouTube, I own the a Makita 1st fix, which I’ve had for many years and love. Apart from a couple of nails jamming it’s been a great tool. I recently landed a huge job making a 1000 deck boards 8ft x 2ft each having 36 nails in. The deck is 3/4 Phenolic birch plywood sitting on 2×4 softwood bearers. One of the main reason for trying the Dewalt was cost of gas & nails. I made sure the Dewalt batteries were fully charged before beginning work. The Dewalt couldn’t handle the job, I had to unblock broken nails 5 times in 30 attempts. I was using Dewalt nails so tried loading Paslode nails into the Dewalt gun, it still couldn’t handle the phenolic. I also noticed on the Dewalt nails, one side of the nail head was bent upwards and very sharpe to the touch.